February can be a tricky time to fly fish here on Pine Island. Cold fronts, and the wind and clouds that they bring, can shut down all but the very best anglers chances with the fly. Even though I emphasize this aspect of my charter business, I am definitely not a purist for the fly rod and never leave the dock without spinning gear on my boat. So when it's time to pull out the hardware on a cruddy day, I usually pick from a small handful of go-to lures that I can count on to produce. My first choice is usually a topwater, which is my favorite of all artificials to throw with a spinner. These work exceptionally well when it's overcast but not so much in choppy or very cold water. When conditions are right I'll pick either a Heddon Zara Spook Jr. or a Flats HQ Flats Walker. The Zara Spook is a proven lure that has been around for almost a century. It has the best action of any topwater with its famous "walk the dog" retrieve which just begs fish to kill it. That zig-zagging action is also one of the Spook's drawbacks as it requires a very precise combination of rod tip twitching and steady reeling to get just right. Some anglers never get this rhythm and without it the lure is almost useless. The other issue with the Zara Spook is the twin treble hooks Heddon uses. For starters, they're way too weak for saltwater use and I've had more than a few big reds and snook straighten them like paper clips. I've e-mailed Heddon about this in the past but nothing has changed. I'm sure it's a cost issue but I shouldn't have to swap hooks on an $8 lure. Those trebles also snag grass terribly which isn't much of a problem now but is sometimes impossible to deal with in the summer. You can replace them with a single J hook but in my experience this also changes the balance and compromises the walk-the-dog action. Despite those complaints, the trusty Zara Spook Jr. will usually be my first choice when I'm using a spinning rod in clean water on a calm, overcast day. It really works and you can find these lures at every tackle shop in Florida. When water conditions aren't as perfect and especially when I have less experienced customers on the bow, the Flats HQ Flats Walker gets selected. 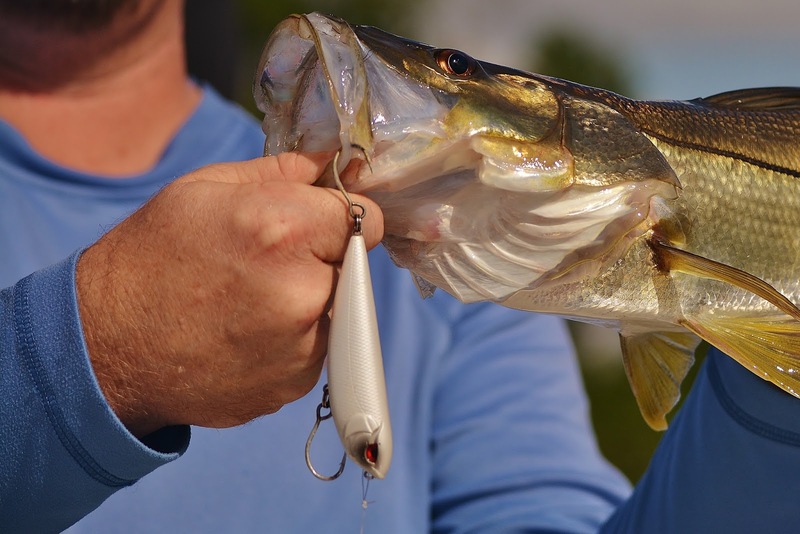 These are relatively new lures and are made by a local company in Bonita Springs. The Flats Walker doesn't have quite the same noisy topwater action as the Zara Spook but it's far easier to use. A straight and slow retrieve is enough to give it a jerky, "crippled mullet" impression which anyone can quickly master. It also has a slightly cupped nose which gives it a better push of water that predatory fish can feel with their lateral line in choppy water. Best of all, the Flats Walker is available with very strong single or treble hooks and runs perfectly with either style. I definitely prefer the single hooks which are easier on the fish and make this lure nearly weedless in most situations, especially compared to the Heddon Spooks. A few local shops are carrying these lures but you can also order them online at www.flatshq.com. There are dozens of other great topwaters out there but these are the two that take up most of my tackle box. They cover every situation where I’m looking to fish on the surface with any angler I may have on the boat. Give them both a try and you might pick a favorite. Or if you’re like me, you’ll end up buying a bunch of each.